While the stock market has more room for winners than professional swimming, Bal has found that many of the same lessons he’s learned from his sport apply to his investing. He was kind enough to share his story with us. Hailing from Sacramento, CA, Bal has been swimming since he was four years old. While he played other sports as a teenager, he excelled in swimming, and pursued the sport seriously, eventually earning a scholarship to swim at Stanford University. In 2000, he missed joining the Olympic team by .14 of a second (in swimming, he adds, “hundredths of a second can separate you from someone else”). However, he felt redemption a year later when he made the USA swimming team and went on to win the world championships in Japan. Passionate about the sport, he decided to pursue swimming professionally after graduating in 2003. He trained with the collegiate team for a year and has since trained and competed independently. He also offers his services to the sport by speaking to young swimmers about the work ethic that goes along with success. “You have to swim slowly with perfect technique, before you can swim fast,” he says. Over the years, Bal has experienced his fair share of frustrations, such as again missing the Olympics by a mere split second, as well as gratifying successes, such as breaking the world record in 50-meter backstroke. Together his career ups and downs have helped him maintain a humble attitude, an open mind, and an unwavering respect for hard work and discipline. He brings this same humble yet determined outlook to his money management. Bal took up an interest in investing while he was in college, starting with a small portfolio and a relatively aggressive, day-trade-oriented approach. “I was probably paying more in commissions than I was making at the end of the year,” he jokes. He entered the market during the dot-com boom of the early 2000s. “Then the crash came,” and he lost money, and he watched a lot of friends lose even more money. This sobering experience tempered his investing style and set him on a path to becoming a smarter investor. Bal now describes himself as an income investor focused on blue chips and low-volatility dividend stocks. He likes to reinvest dividends and employ covered calls and covered puts as way to create additional income from stocks he owns. For him, dividends and options “add back the aggression” of his early days of investing, but without the same level of risk or the accumulating commission fees. Hearing Bal discuss his strategy, I had to politely refute his original self-assessment as a “novice investor,” suggesting he was much more savvy than he originally let on. 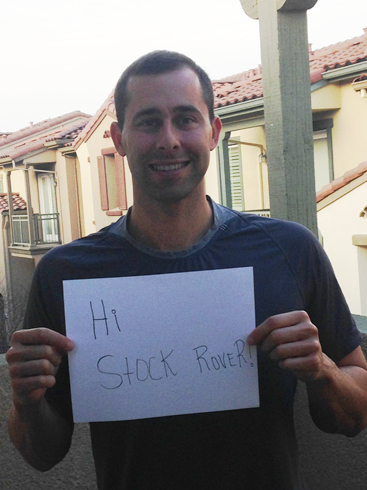 He protested that he is still a student of the field, and I couldn’t disagree with him there, especially as we at Stock Rover feel similarly, that there is always something to be learned about our own investing processes. He attempts to maintain a similar mindset to the one he has in sport, “where you let your rules set the course,” to keep himself from getting too emotionally involved and potentially making poor decisions. Like this, much of Bal’s outlooks resonates with the Stock Rover ethos. Most fundamentally, his intention to be both independent and smart about his money aligns with our values as a company and our original vision for the product (see our mission statement). In Stock Rover, Bal particularly likes the ability to select a security and use it as a benchmark with others, such as by entering it as a research ticker or setting it as a baseline in the chart. He also takes advantage of peer comparison tools to understand how a stock performs against those in its sector and industry. As Bal hones his investment decision-making in his free time, he is also training for several swimming competitions in the coming year, including the Santa Clara International in June and the National Championships in San Antonio in August. We’ll be rooting for him!